Bentes, B., Martinelli-Lemos, J. M., Lutz, I. A. F., Nascimento, M. S. & Isaac, V. J. Population dynamics of Macrobrachium amazonicum (Heller, 1862) (Decapoda: Palaemonidae) in a Brazilian Amazon Estuary. 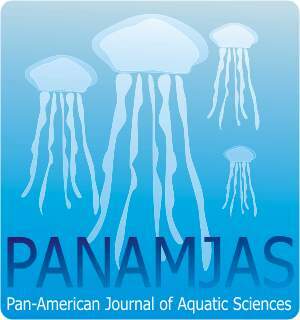 Pan-American Journal of Aquatic Sciences, 11(1): 1-17. Download PDF file (4,391 Kb). D�az-D�az, O. F., Bone, D., Rodr�guez, C. T. & L�pez, A. Polychaetes associated to calcareous sediments, Venezuela: Eunicidae. Pan-American Journal of Aquatic Sciences, 11(1): 18-25. Download PDF file (207 Kb). D�az-D�az, O. F., Bone, D. & L�pez-Ordaz, A. Polychaetes associated to calcareous sediments, Venezuela: Canalipalpata. Pan-American Journal of Aquatic Sciences, 11(1): 26-38. Download PDF file (1,586 Kb). Vargas-Ceballos, M. A., L�pez-Uriarte, E., Garc�a-Guerrero, M. U., Vega-Villasante, F., Rom�n-Contreras, R., Akintola, S. L., Valencia-Martinez, R. E., Del Rio-Zaragoza, O. B., Alalos-Aguilar, J. J. & Chong-Carrillo, O. Infestation of Probopyrus pacificensis (Isopoda: Bopyridae) in Macrobrachium tenellum (Caridea: Palaemonidae) in the Ameca River, Jalisco, Mexico: prevalence and effects on growth. Pan-American Journal of Aquatic Sciences, 11(1): 39-46. Download PDF file (278 Kb). Beauclair, M., Duarte, M. R. & Silva, E. P. Sambaquis (shell mounds) and mollusk diversity in the past history of Araruama Lagoon, Rio de Janeiro, Brazil. Pan-American Journal of Aquatic Sciences, 11(1): 47-59. Download PDF file (561 Kb). Garc�a, C. B. & Ram�rez, J. Perceived length at first maturity in the lane snapper, Lutjanus synagris (Linnaeus, 1758) (Perciformes: Lutjanidae), along the Caribbean coast of Colombia. Pan-American Journal of Aquatic Sciences, 11(1): 60-69. Download PDF file (295 Kb). Alfaro-Shigueto, J., Mangel, J. C., Valenzuel, K. & Arias-Schreiber, M. The intentional harvest of waved albatrosses Phoebastria irrorata by small-scale offshore fishermen from Salaverry port, Peru. Pan-American Journal of Aquatic Sciences, 11(1): 70-77. Download PDF file (578 Kb). G�mez-Maduro, M. C. & D�az-D�az, O. Presence of Platynereis mucronata de Le�n-Gonz�lez, Sol�s-Weiss & Valadez-Rocha, 2001 (Polychaeta: Nereididae) in Venezuelans waters. Pan-American Journal of Aquatic Sciences, 11(1): 78-81. Download PDF file (974 Kb). Gurdek, R., De La Rosa, A., Corrales, D., Canavese, R., Gutierrez, J. M., Stebniki, S., Mu�oz, N., Severi, V. & Acu�a-Plavan, A. Estuarine use and composition of fish species in the Sol�s Grande sub-estuary, Uruguay. Pan-American Journal of Aquatic Sciences, 11(1): 82-86. Download PDF file (221 Kb). Port, D., Branco, J. O., Alvarez, C. E. & Fisch, F. Observations on endangered frigatebirds (Fregata ariel trinitatis and F. minor nicolli, Suliformes: Fregatidae) at Trindade Island, Brazil. Pan-American Journal of Aquatic Sciences, 11(1): 87-92. Download PDF file (769 Kb).